Physical robot-robot interaction. Credit: Tirupachuri et al. Researchers at the Italian Institute of Technology (IIT) have recently proposed a coupled-dynamics formalism and a new approach for exploiting helpful interactions with humanoid robots. Their paper, which was pre-published on arXiv, also presents a number of task-based, partner-aware techniques for humanoid robot control. "Robots are evolving at a rapid pace, and many recent developments are addressed at bringing down the fences in which robots are currently placed and making them safer to physically interact with the environment and people," Yeshasvi Tirupachuri, one of the researchers who carried out the study, told TechXplore. Humanoid robots are designed to resemble humans, embodying anthropomorphic abilities that allow them to engage actively with human environments. In addition to ensuring that they are reactive to physical interactions with external agents, this team of researchers at IIT is also trying to make them capable of actively engaging and interacting with agents to realize a common goal. "We think this research approach enables a robot to be more resourceful in many tasks, either to assist humans or to augment human capabilities," Tirupachuri says. 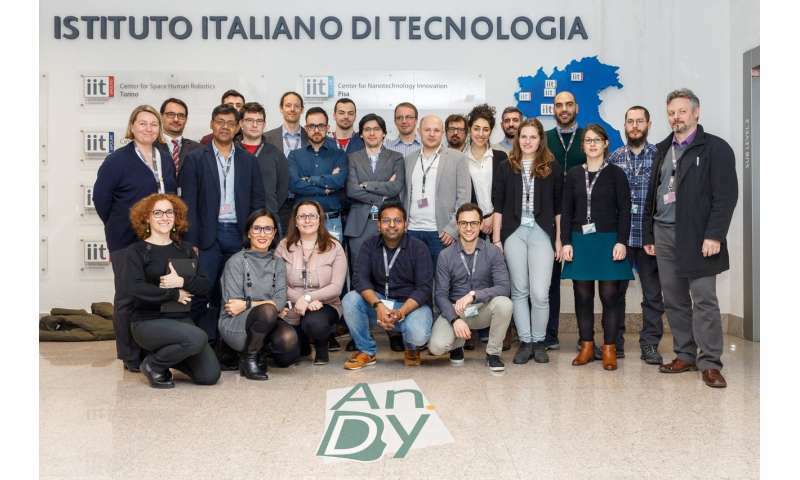 The Italian Institute of Technology (IIT) is currently working on a project called An.Dy, funded by the European Commission, aimed at enhancing human-robot and robot-robot collaboration. Their recent research efforts focused particularly on understanding and exploiting humanoid robots' physical interactions with external agents. "The main objectives of our study were to formulate a general mathematical framework, that is, a language, through which a robot can understand its physical interactions with external agents, as well as to define how these interactions can be exploited for any task completion by the robot," Tirupachuri said. In their recently published paper, the researchers presented a coupled-dynamics formalism and a new approach to improve interactions with humanoids robots, as well as new task-based, partner-aware techniques for humanoid robot control. "A robot is a system composed of multiple rigid bodies," Tirupachuri explained. "The laws of physics that govern such a system of rigid bodies is encapsulated in the dynamics of the system that helps in understanding how the system evolves in time under external influences. In case of multiple agents engaged in physical interaction, the dynamics of individual agents, observed in isolation, will not provide enough information to make sense of its system evolution." This limitation is primarily due to the complexities of mechanical coupling during a humanoid robot's physical interactions. According to the researchers, to better understand these interactions, they must consider the dynamics of both interacting systems together, rather than in isolation. "We hence take into account the dynamics of the combined system and present a coupled-dynamics formalism through which the robot dynamics can be understood thoroughly under physical interactions with any external agent," Tirupachuri said. "Toward this goal, the interacting agent dynamics are also formulated in a mathematical language, similar to the robot system, using rigid body assumptions." Typically, force-torque sensors are placed on a humanoid robot, allowing it to make sense of external perturbations caused by an external interacting agent. The researchers, however, decided to focus specifically on the efforts spent by an external agent while engaging with a robotic system. "The effort of an agent is, to a great extent, self-governed and self-regulated, even under physical interactions," Tirupachuri explained. "Under the assumptions of rigid body systems, an agent's effort is quantitatively represented by the joint torques. So through coupled dynamics, our control techniques enable the robot to understand how the interactions with an external agent are occurring in terms of the agent's effort. Eventually, the robot exploits this effort if it is helpful to achieve a common goal." In contrast with prior efforts, therefore, the approach devised by Tirupachuri and his colleagues is aimed at enhancing a robot's awareness of external agents it is interacting with. Their research could pave the way toward the development of more responsive humanoid robots that perform better in tasks involving human-robot interactions. "The scenario we are envisioning involves a human and a humanoid robot engaged in physical interaction," Tirupachuri said. "This kind of scenario will be important in future work environment, where robots and humans will collaborate to foster the 'ergonomy' of the workspace, thus avoiding dangerous situations for human health. In such a scenario, the human wears a sensorised suit that runs a novel algorithm developed by our team to get complete real-time kinematic and dynamic information from the human." While testing their general control framework on two humanoid iCub robots, the researchers encountered a series of challenges that need to be adequately addressed in order to move the project forward. "The main limitations that we facing are due to some aspects of the current mechanical design of the iCub hands which are clearly not capable for performing any power grasps to engage in prolonged physical interaction with each other," Tirupachuri said. "We are now developing a novel mechanical contraption to get around this shortcoming." Tirupachuri and his colleagues are now working on a real-time human dynamics estimation system. Once this system is fully developed, they plan to validate their theory further by running more experiments involving a human agent and a humanoid robot. "We are also at the initial stages of experimental design to implement our approach on an exoskeleton robotic system that will assist a human in doing overhead tasks on an assembly line in an industrial shop floor setting," Tirupachuri said. "This is aimed to improve the comfort for humans by providing ergonomic support to perform the task repeatedly." Finally, the researchers are also investigating new physical interaction scenarios that involve two robots—for instance, carrying objects together. These tasks entail additional challenges, as the control design will need to account for the dynamics of the object while also considering the shared autonomy of the two robots to realize the task successfully.